I joined FNSI... Friday Night Sew In. Granted I'm a week late for the August FNSI, (it was August 17th), but when I stumbled upon another blogger's post about it, I investigated. Remember, I've only been in blogger land for about a month... so much of what I'm discovering isn't new to many of you, but it's new and exciting for me! For more info on FNSI, visit craftyvegasmom.blogspot.com or handmadebyheidi.blogspot.com. These two talented ladies started it all, and they have quite a following. I'm a follower, so I signed up! Even though I'm late this month, I'm looking forward to the FNSI in September, and the months ahead. Maybe by committing myself to this, I will get more projects completed... one can only hope! Since I did spend last night in my sewing room, I'm going to show what FNSI was all about for me! Starting a new project can be invigorating! If you've been reading my blog, you know I'm heading for my annual quilt retreat to Northern Minnesota very soon. This is a new project that I hope to take with me and complete while I'm there. The fabric is Everlasting by Sandy Gervais for Moda... one jelly roll and one charm pack. (Purchased online from fatquartershop.com). The pattern is Boxed In from piecedtreepatterns.com. The finished size is just under 52" square, but I'm leaning towards making a long table runner for a specific piece of furniture in my home. I really wanted to have an idea of how the fabrics would work together in the pattern, so I cut and sewed what was needed to make the four blocks, that will make up one block when they are sewn together. I like!!! I finished cutting the rest of the jelly roll strips as needed and then spent a long time "matching" the strips with a charm pack square. It took me longer to do my matching than it did to sew the four blocks! So that's what I did with my FNSI! It may not have been on the official FNSI date, but it was enjoyable all the same! My "Threads" quilt group kept it simple for our group project this year. 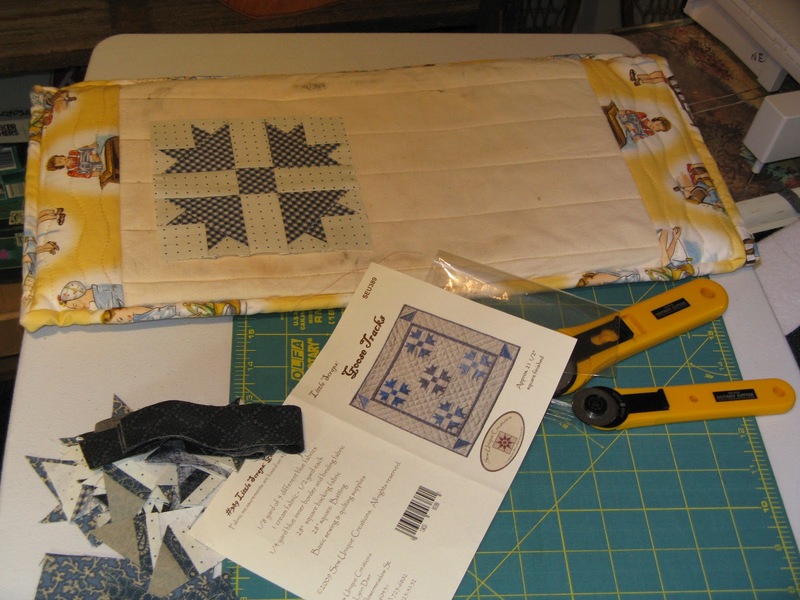 In the past we have done a Round Robin quilt, a Row quilt, a Miniature quilt of our choice, a Flannel Log Cabin/Embroidery quilt, and Birthday Blocks. Back in January each of us selected a paper pieced block of our choice, and distributed the pattern to each of the other members. Some of us provided the fabric with the block, and others gave guidelines for us to follow when choosing the fabrics. Below is an example of some of the blocks that will be given to the rightful owner when we meet at retreat in September. a purse, a tulip, an off centered log cabin, and in the middle, 1/4 of a sunburst. New to-do projects... what every quilter needs! I love Internet shopping! I can't always find what I'm looking for locally, so the Internet answers my prayers! Can't wait to pick out the wool for the January Wool Crazy by Buttermilk Basin! The snowman will be a jolly old soul to make and display throughout the winter months! I've had the Mama Said Sew Charms by Sweetwater for Moda for a while now... not sure what to make. I'm looking for some ideas from all of you! What lovely did you create using this fabric line? Who doesn't have a collection of patterns from Pieced Tree Patterns? If you don't, you are missing out! Everything you need on a laminated 3 x 5 card! What could be easier! I've chosen the Boxed In pattern with Everlasting (Sandy Gervais for Moda) as my fabric. Love, love, love the fabric! The pattern calls for one jelly roll and one charm pack. The plan is to have everything cut, packed, and ready to sew while on retreat in September. Can't wait! Last May while visiting family in my home state of Wisconsin (Go Badgers! Go Brewers! Go Packers! ), I took a road trip to the picturesque town of Spring Green, northwest of Madison, and home to Country Sampler. The route of choice included hilly and curvy back roads, and I so enjoyed the drive. After visiting Country Sampler via their website over the last couple of years , I knew I just had to pay a visit to the shop. If you like primitive, the worn appearance of new quilts, and exquisite quilting, Country Sampler is a shop NOT to be missed. (What a time to be without my camera!) They offer an abundance of models to drool over, and many of the models have irresistible kits that scream "take me home with you!" I purchased the Back to Charm School book by Country Threads and the kit to make the table runner in the picture above. One more project on the to-do list! You can visit Country Sampler by clicking on this link. Be sure to check out Jeanne's blog. Enjoy! Time to get busy in the sewing room... I'm trying to narrow down the number of projects to take on retreat. Not an easy task! ... I leave for retreat in Minnesota. I'm slowly getting ready. I still have one block for our block exchange to finish and I'm about half done with my gift exchange item. I'm banking on the coming weekend to find the time to complete both. I haven't yet decided which unfinished projects will make it into the "to do" suitcase. And naturally, I want to take NEW projects to work on. Let's not forget that for Caroline, Queen Dee, and I, it will be necessary for us to stretch our legs occasionally during the seven hour trip. They say the best exercise is walking... so walk we will! Right into and around the quilt shops we visit on the way! This means that we will have to reserve space in the car for the lovelies that we purchase before we even get to our destination! One project that I will be happy to pack is actually complete! At last years retreat several of us ladies made a Coffee Cup Caddy, pattern available at flossieblossoms.blogspot.com, in her ETSY shop. I chose fabrics that surprised even me! I like how "fun" the fabrics look. The flower prints are Happy Mocha Yum Yum by Lucien. The pink dot fabric is from my stash. The caddy needed company so I made a sewing machine cover, and a coaster for my real cup of coffee. Something was missing... a pin cushion! I used a paper pieced, 2 inch diamond shape pattern that I discovered on a blog about two years ago, quiltsalott.blogspot.com/search/label/pincushions. I filled it with walnut chips. It's cheerful and reversible! And I will be cheerful every morning as I sit down to sew! ... the girls of "Threads" will be heading north to enjoy crisp autumn air, the serene waters of Pleasant Lake, and the hum of sewing machines. Our annual Northwoods Retreat to Minnesota in early September will bring mini road trips, boat rides, hand sewing on a sunny deck, card playing, naps in a hammock, marshmallow roasting, star gazing from the end of the pier, giggle fits, eating delicious meals, and most importantly, talking loudly over each other in order to be heard! Prepare ye selves... and here a few reminders of past retreats. Taking advantage of the gorgeous weather! This must have been day one... it looks too neat. This year the sewing room will move back to the second floor of the main lodge. As much as we all dread hauling our "stuff" up the stairs, it's the best option, considering all the "stuff" we bring! Message to my roomie... remember, the third bedroom in our cabin is not a walk in closet for your projects... See you in September! As I sit down to write this post, flashes of lightning, crackles of thunder, and a refreshing down pour of dancing raindrops make me smile! Please don't stop! Iowa welcomes you! Park your dark clouds above us... stay awhile! I love to visit quilting blogs, but I get so jealous when I see quilters who post their accomplishments almost daily! I'm loving the July and August weekly 4.5" square Summer Star quilt blocks from Sheryl at Temecula Quilt Company. The best I can do is refer back to her blog when I'm actually ready to make these darlings! Maybe my problem is time management. Then there's this thing called my full time job. So for now I dream of retirement (5-6 years away), and/or winning the lottery... whichever comes first. My sister (she's older, and only she will understand why I mention this), use to sew her own clothes. She whizzed through Home Ec in high school, and continued to press on with her trusty Singer during her career days. A few years ago, after motherhood, managing a ski school, and devoting many years to her neighborhood association board, she decided to dust off that very same Singer and sew seams together once again. Only this time she went a different direction, and joined the vast population of addicted fabric collectors and pattern hoarders. After realizing how serious she was getting about this hobby called quilting, I talked her into using a Viking machine that I had purchased from a quilting friend, but I wasn't using it as ofter as my Janome. Well she really liked it! Last week she sent me a text with a picture of her new Husqvarna Viking Sapphire 875 Quilt, Sewing, and Quilting Machine. Second time in this post that I must use the word JEALOUS! I visited my family in Wisconsin for a few days this past May, and naturally, Mary Jo and I spent a day visiting some of her favorite area quilt shops, including The Quilted Basket in Menomonee Falls. I'm always looking for small quilting projects because that's what I seem to have time for... as far as beginning and finishing a project. The Centerpiece Tablemat from Sweet Treasures caught my eye, (it helped that the shop had a model), and I knew it would be a pattern that I would use quite often. What makes it sweeter is that I used fabrics from my stash! It's light and airy... perfect for displaying a collection of treasures. What do you think? The doll is a favorite from my childhood. Thanks Aimee, for the beautiful stippling! 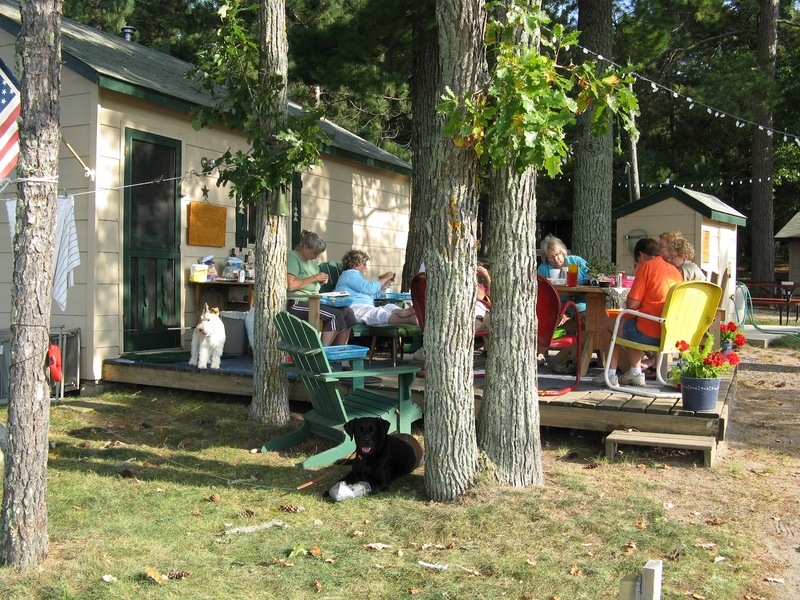 Days of watermelon slices, sewing on the porch, the Iowa State Fair, and memories of summer vacations at Uncle Eddie's cottage on Hills Lake, Wisconsin. Paper pieced watermelon quilt... this was a fun project! and sister's was purple... we spent the day having fun in the waters of Hills Lake, WI. Countdown to September Retreat begins... this means I have to finish my gift exchange present, start and finish one more block for our group project, purchase and/or make bingo prizes, (Yes! We play bingo at retreat! ), begin checking the Northern Minnesota weather forcast at least 7 days before leaving, make arrangements for family to feed my cat, pack at least one T-shirt with "Green Bay Packers" displayed on the front, clean my sewing machine, limit the number of spools of thread I will pack, and decide what and how many projects to pull from my stash because I'm sure I'll get them all started and completed!!! (Not!) August... a very busy, and exciting month!! !